Soil is probably THE most important component of a successful garden. When it comes to soil, there are many options, each with it’s benefits and drawbacks. Here I will outline some soil choices, and you can pick the one that fits your situation. This is potentially the least expensive option for new gardeners. However, it also can be the most complicated and labor intensive. It may sound crazy, but you can garden in pure compost. This mix is recommended by Mel Bartholemew, the founder of the square foot gardening method. 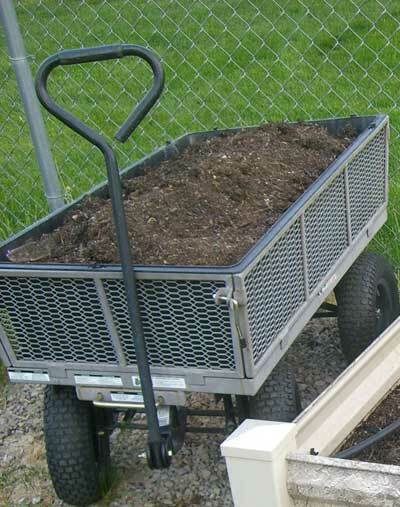 By using less peat moss and vermiculite, you can cut costs slightly (up to 6%). By buying compost in bulk, you can really save money (up to 25%!). However, coming from one source is a disadvantage, since it won’t have a balance of nutrients. You can probably find a local nursery or sod/soil company that will sell you a bulk garden mix. Some companies even deliver! The prices I found locally ranged from the least to the most expensive option listed here. Soil is only as good as the ingredients, might be fantastic, or might be mediocre. As I find more ideas and options for garden soil, I will add them to this article. Any ideas and feedback you have is most welcome! Stay away from the Steer Manure. The Purple Cow is made of leaves and alfalfa–this is a great example of how using just one source would be quite limited in nutrients. The worm castings look good, if strong. You probably don’t need equal parts by weight. Humus and manure looks like another version of Steer manure, but it does specify cow, so it’s probably okay. You might even look for a mix–I buy Soil Building Compost or other garden bed mixes. Sherry–add more compost to your soil. Preferably, a mix from several sources. Pull those weeds when they are little, but they probably won’t be a big problem. The reason your cauliflower and cabbage did not grow well is probably because it was too hot. They need cool temps, early spring or fall. Last year I started a square foot garden. The guy who built it for me used local products for the soil. He did not use the traditional Mel mix; but a modified version. Last year I had some produce – lettuce, green beans, basil, cucumbers, and rosemary. It was more than I’ve ever grown before. The cauliflower and cabbage didn’t grow well, but I think it was too hot and dry. I watered every day, but it wasn’t enough. I’m getting small weeds in soil now. I haven’t planted yet. Do you recommend that I add anything to the soil before I plant? Most potting mixes seem quite empty to me–it’s basically peat, perlite, and some fertilizer. This is fine for houseplants, but for the garden you need more, I think. That’s why the mix I recommend contains a high proportion of compost. This should improve it’s nutritional value for the plants. Can this garden soil be modified to become a potting mix? Garden Safe Garden Soil is a completely organic vegetable soil that contains natural plant food. It grows delicious and incredible vegetables and herbs. It contains a special blend of organic soil made from natural ingredients, including sphagnum peat moss, composted bark or reed-sedge peat, organic plant food and a natural wetting agent. It provides slow-release food that lasts up to 3 months. Nick–you should be fine. Peat moss is going to help retain water. Depending on your garden soil, it might hold some water as well. If you’re worried, simply add in some peat moss. It’s pretty inexpensive. If that’s not a n option right now, just add some next year. It doesn’t have to be perfect to work, and if your garden isn’t all you hoped it would be, next year try again and make adjustments. I just put my soil in my SFG but afterwards realized I bought, mixed, and put in the wrong stuff. I used 1/3 organic garden soil, 1/3 vermiculite, 1/3 cow manure. Absent minded, I know, but no peat moss. I live in South Florida and its plenty rainy here so I hope it will still work out. Also, the only compost available is from manure. Any idea if I should save my seeds and rebuy my mix or if it should work out? I don’t know why things do and don’t work, only the recommended mix. Composted manure is 90 days before harvest. I use Dr Earth Soil,and #5 fertilizer with plenty of Worm Castings.Last year,here in eastern NC ,I was eating vine ripened tom`s on the last day of May.This year,in one 4×4 box, I will try Dr Earth Soil,as the compost in Mel`s mix,and use it around the base of some plants that are required to be kept moist. Katie–my experience is, the dirt will need to be replenished every year. I would start replenishing with Mel’s Mix, and eventually it should be great soil. What do you do when your boxes are filled with dirt, do you think I can mix them with mels mix? The dirt I have is from Home Depot and is like Miracle Grow for plants. I’ve never heard of it–do you have a link to more info? I have gotten bulk compost, and there are lots of opinions about using it. If it’s pure greenwaste, it’s great. But sometimes they combine human waste with that, and then who knows what’s in it. People worry about medicine and chemicals, and whether it’s sanitary. Others garden in straight compost from the dump and claim it’s black gold. My suggestions: buy plants for tomatoes, peppers, eggplant. Too late for broccoli, cabbage. You might be able to grow peas in the shade, or wait for fall. Plant from seed carrots, beets, beans, cucumbers, squash. You don’t gain much buying plants, especially with the crazy weather we’ve had. Great break down on price! Love it, thanks. This will be very helpful to people just putting together their garden. I was wondering if you’ve ever looked into getting compost from the dump? I live near the Layton landfill in Davis County. Apparently, food waste from restaurants is composted there, and you can buy it by the cupic yard, which from what I understand fills the bed of a pick-up. I’m wondering if that’s considered “one source compost” or if it’s not. I’m assuming all food waste going in isn’t one source because there’s lettuce, onions, bread, etc. Am I off base, or is this a good idea? Thanks to our crazy spring, I’m just barely getting started on my garden. I built my boxes over the winter (which just so happened to be 2 months longer than normal). Do you have any tips on what to buy now that it’s supposed to be climing into the 100 degree range fairly quickly? Thanks so much!! What is you take on Miller’s Mix for box gardens? They clam to be better than mel’s mix and I have one 4X4 box of it that seems to be doing really well. 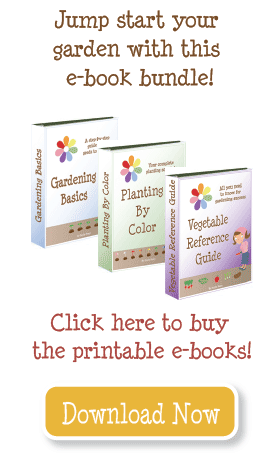 I love your blog – easy to read and helpful for the new gardener. 🙂 Thanks! Just a thought: you may be able to get compost for free through your local waste company, especially if they have a yard waste pickup service. We can out here in California, and there is no limit on how much you can pick up (it is haul-it-yourself though, so you’ve got to find a truck or something to carry it home in) so my garden beds ended up about 60% free compost, 20% purchased soil, 10% free backyard dirt (not great quality), and 10% vermiculite and peat moss. Even with the purchased soil, peat, and vermiculite, I still filled a 4’x8′ bed 1′ deep for very very cheap – about $40 total. I just finished filling my boxes and planting my garden and I did a mix between Mels and a modified version. I looked at what I wanted long term and it was good soil from the start. If I filled mine with mostly top soil and then amended (like a lot of my friends), I would be spending more in the long run adding to the soil every year. If I forked over the money for a good mix up front, I would be saving money later on. I was able to find vermiculite for $20/bag which is incredibly low considering what I was finding elsewhere. I also was able to get horse compost for $15/load which was our entire truck bed full to the max off of craigslist. It had been composting for 5-8 years and was steaming when we picked it up. We then added several other kinds as well as peat moss. My suggestion would be to check craigslist for things like this too.